HyWay is the new landmark in the panorama of office chairs. It has been designed for Quinti by Orlandini Design Studio. Refined design, smooth and defined shapes, attention to details and a wide range that can match with its functionality and versatility the requests of any working environment. HyWay represents a new way of interpreting office chairs keeping quality, well-being and technological excellence first. Hyway represents the new design identity made by Quinti: a unique and inimitable design to create a new office environment. The depths and edges define the lines of the seat, adorned by using refined materials and coverings. The high backrest version is completely made of moulded polyurethane foam for executive purposes. The thin profile of the backrest opposes to the important thickness of the seat and of the lumbar area. The new “soft” version, thanks to its horizontal and elegant stitching, enrich the range. Hyway seat in all its elegant line, enclose technical and functional contents of high significance. The backrest is made of cold injected polyurethane moulded foam which can guarantee a perfect support, the dimension and structure of the integrated armrest ensure the height of comfort, the mechanism allow for all kind of body type a complete versatility of the seat. Aesthetically is possible to customize single part of the seat (armrests or back) by using different materials for the upholstery or different colours. Hyway has a soft mould with a consecutive surfaces design which remind the multiple faces of a diamond. The back and armrests, completely separate from the seat make up in a singular body and gives a functional, technical and innovative image to Hyway, ensuring versatility and comfort in its use as well. The low backrest version is available with a synchronized mechanism and with a new SoftLift device. It is ideal for meeting tables or as a visitor for high level offices. The elegant armchair with its simple and clear lines integrates Hyway range, which is with craftsmanship well padded and upholstered. The shape and dimension make it the right solution as complement for each office environment as well: as front-desk or in waiting or meeting area, Hyway armchair is always a synonym of elegance and functionality in reduced space. A wide opportunity of customization is also possible thanks to the multiple structures and countless coverings. The simple and minimal lines also suggest to use Hyway chair inside restaurants, bar, conference rooms and all environments reserved to the community. The 4 metal tube legs in varnished or chromed finish ensure a functional use and easy matching. The metal legs and to be more versatility in its use can be equipped with self-breaking castors. For all models is also available the “Soft” version with horizontal stitching on the back. The Hyway chair with wooden legs is conceived to be used for contract purpose and inside restaurants or bars. The modern lines of the seats perfectly integrate with the classic liking of the wooden oak legs in natural or dark brown finish. Useful, essential and solid can be also used for residential purpose with success. The wide range of colours and coverings available makes this chair for all-purpose and an irreplaceable complementin furniture. The versatility of Hyway chair becomes an elegant and refined tub chair. Contemporary and welcoming, useful and solid represents the right compromise in order to furnish all environments that seek elegance and functionality. Conceived for contract, conference and meeting areas as well, the folding version with open sides gains the best of its purpose giving priority to the space without any compromise on design which is contemporary and light. Tub chair made of moulded polyurethane foam. 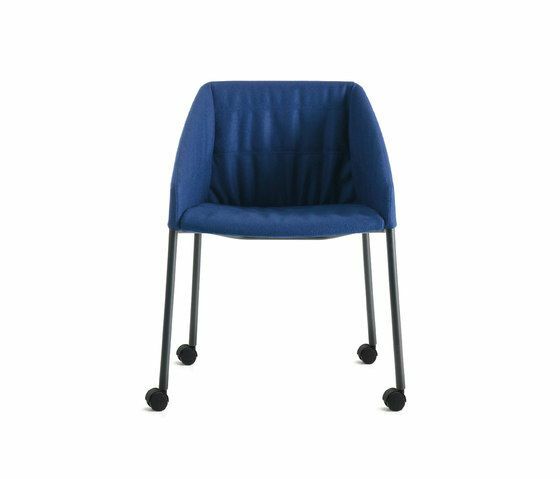 Wide and welcoming seat, soft and flexible backrest make these chairs ideal for meeting and conference. Available on feet or castors and with folding open side can be also equipped with writing tablet. It opens or closes itself thanks to few and easy movements in order to be placed in very reduced spaces and used if necessary. Upholstered with craftsmanship by using all the available colours and materials. Hyway tub chair represents the right finish to furnish the formal or informal meeting area with elegance. The seat is welcoming and comfortable, the backrest is wide and strong. The compact but not too much size allow the use around the meeting table, waiting area or community as well. Available on feet or castors can be customized by using materials in different colours (even for single part of the structure) or with the writing tablet. Tub chair made of moulded polyurethane foam. The seat is welcoming and comfortable and the flexible and soft backrest make it ideal for meeting or conference. The folding tub chair with closed sides is available on castors or feet and can be equipped with writing tablet. It opens or closes itself thanks to few and easy movements in order to be placed in very reduced space and used if necessary. A metal tray is also available that allows to carry and store the chairs when not needed.